Recommended: 2GB NVIDIA 7xx series, a 2GB AMD R9 series, or better. 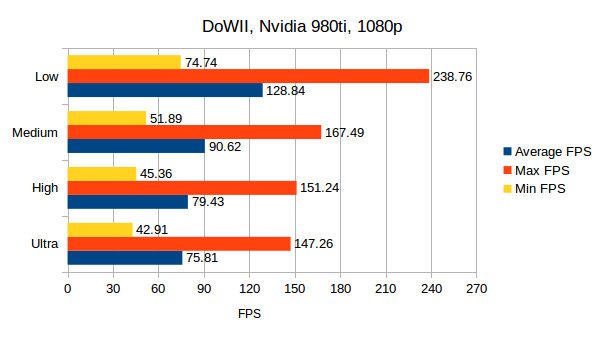 NVIDIA cards require driver version 367.35 (officially tested against). AMD and Intel GPUs require MESA 11.2 (officially tested against). As noted in the benchmarks below, I tested on Nvidia 370.28 which also works fine. 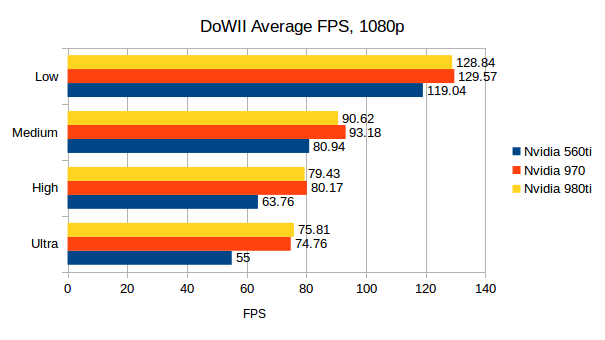 The game has a built-in benchmark mode, so it joins the list of games that make benchmarking easier! It also means I can show off some of the performance you might expect to see using my available cards. I’ve not played a Warhammer game in a long time and I never played these games on Windows, so for me this is brand new experience and a real treat. I am a big fan of RTS games as you all know by now! Note: Sadly, like Company of Heroes 2 these games do not support cross-platform multiplayer with Windows. Important to note, as this may be a deal breaker for some of you. You can see their explanation of why this is the case for CoH2, which likely applies here too. 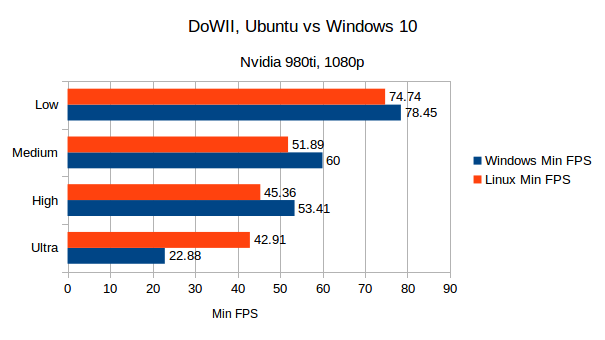 Linux vs Mac works fine for online play. I will be doing weekly games of Dawn of War II with Matt from Feral Interactive every Monday. I will also livestream these events. The times will currently be 1-2PM BST (12-1PM UTC). This is in addition to the Wednesday game we already do together in Company of Heroes 2. Follow me on Twitch to catch them all! The game will activate the Steam Overlay at the main menu to ask you to sign up and login to Relic’s account system for the first few times. It seems the number of times it appears is random, and it is quite annoying. It does seem to stop eventually. I feel the need to stress that everyone's results will be different. Benchmarks never give a true representation of what you're likely to achieve. 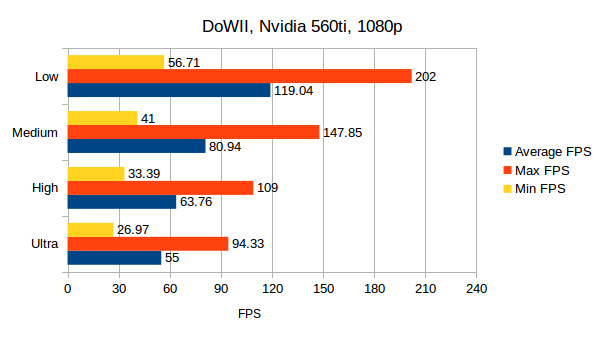 If you want to see me do benchmarks with more cards, consider supporting me on Patreon. All benchmarks ran multiple times to be sure of their accuracy. All done using the preset drop-down, with no additional tweaks to the settings. Note: You can click a single image, and then scroll through each using the arrows that appear on hover at the side. Note: Below their minimum specifications, mainly as they don’t have 5 series to test on, not that it won’t work with earlier cards. 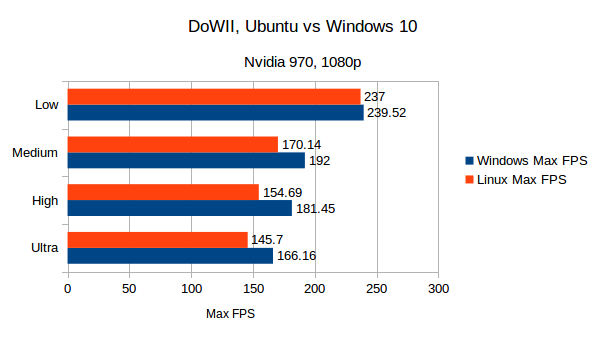 While I personally don’t game on Windows, so the Windows performance difference doesn’t usually bother me, I completely understand people want to see it. 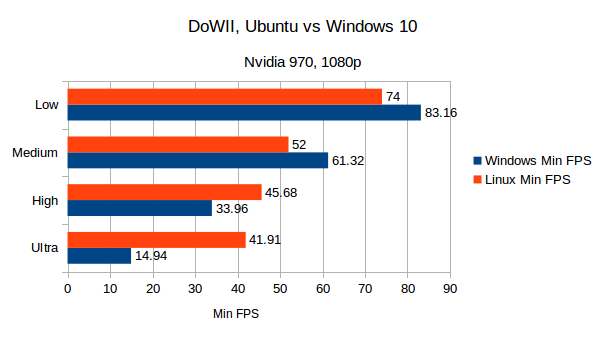 Linux has a clear lead when it comes to the minimum frames at the highest end here. 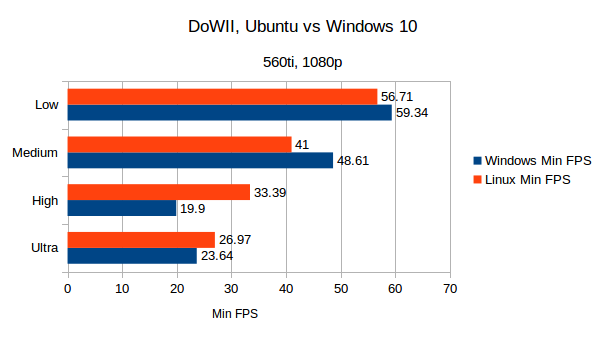 Feral's port here does better at holding the minimum frames versus the original Windows version on the two highest modes. Again, Feral's port here does better at holding the minimum frames versus the original Windows version on the two highest modes. My take-away here is that Warhammer 40,000: Dawn of War II for Linux is very playable even on a rather old Nvidia 560ti. That’s really great news considering the age of the card. I also tried the game on my main desktop which has the top-end i7 and the scores were near enough the same. The change was so small it’s not worth showing. I think this is one of Feral’s best ports. 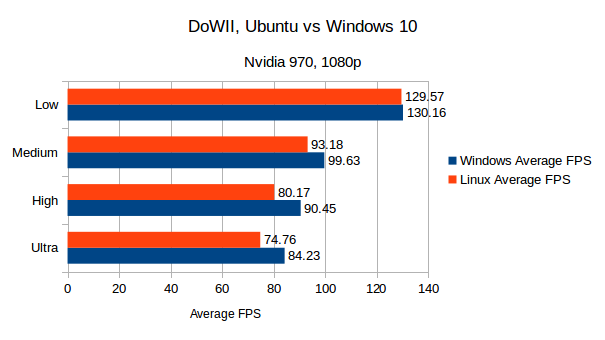 Not only in terms of performance, which has been iffy in some of their other ports, but the game has also been as stable as a rock. Often when I test games (Feral’s or otherwise) I come up against weird crashes, freezing or other Linux-specific bugs. I’ve had nothing to report back to them on—zilch. Starting Note: All three games allow you to play their campaign in co-op online. So if you’re finding it a bit difficult, you can bring a friend along for the ride! If you have played Starcraft or Company of Heroes 2 you will feel right at home here. The game actually uses the same engine as Company of Heroes 2 and it shows; the cover system is the exact same and gameplay mechanics feel very similar. They are rather different games though with vastly different teams who are rather exciting to play with. You also have hero units with their own set of abilities. The game has completely done away with the base building aspect of traditional real time strategy titles. This makes it feel rather different while still remaining familiar. It plays out a bit like a mix of a strategy game with elements of an RPG thrown in. Your squads gain experience, level up and you have the same ones that move on from mission to mission. After each mission you have the ability to level up your squads with different attributes and change weapons, which is pretty cool as it enables you to play it through differently each time. Depending on how many points you assign to each attribute, you have the ability to unlock “traits” for units too. Your scouts, for example, can have their “Will” upgraded to a point where their energy doesn’t deplete if they are standing still while using their invisibility perk. A mighty handy trait for scouting the dangers ahead of you in missions. You could choose to have turrets, healing packs, better accuracy and so on. If you don’t like some of the wargear you have, you can send those items away for more XP. I wouldn’t throw everything away though, since you may want to swap out your gear depending on who you’re up against. Note: You can only change equipment between missions, there’s no way to do it once you’re committed to a mission. I must admit I’ve been having an absolute blast with the game. Having your main character charge at enemy ranks, sending them flying, while you set up your heavy weapons group to suppress them is awesome. Gave myself bonus points for sneaking a cloaked scout squad around the side to throw in a bomb. What surprised me the most is that the single-player even has boss battles, which can get a little hairy. Thankfully, my leveled up squad equipped with their better weapons and armour I collected didn’t have too much of a problem. The campaign plays out across multiple planets. The first time you jump to another planet shows a little cutscene of you warping through what looks like a wormhole. It’s really short, but damn does it look awesome. Final note about that campaign: Be sure to do the higher difficulties, the first two options I found to be too easy. When it comes to the online versus mode it’s a rather different affair to most strategy games I’ve played. You don’t actually produce any buildings, as you have all you need from the start. It does share the whole “capture the points” system with Company of Heroes 2, but instead of placing new buildings you simply upgrade your initial building to gain access to new units. It makes it simpler, faster, but just as fun. The online mode, although simpler in the way buildings work, is actually still very well thought out. 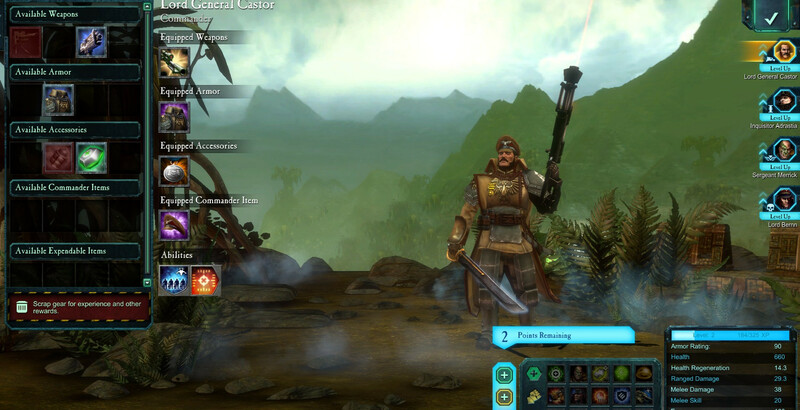 You pick a specific commander who is on the battlefield and each one has a different set of abilities and upgrades. My favourite right now is the tech commander who can place mines and turrets, which are fantastic for harassing your enemy. 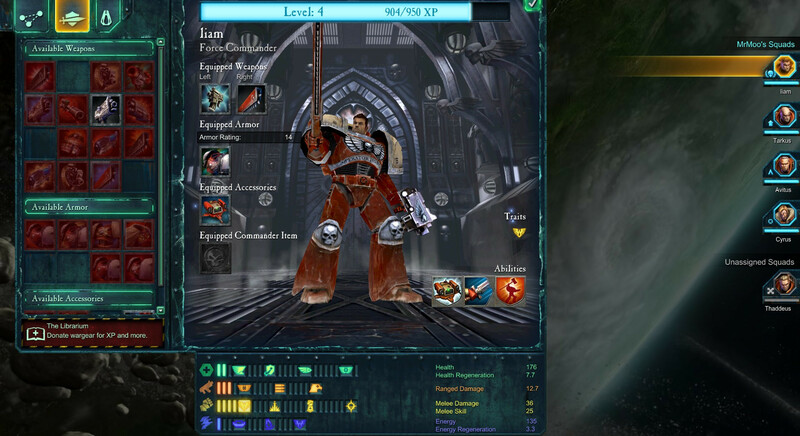 Warhammer 40,000: Dawn of War II Chaos Rising follows on from Dawn of War II and has a very similar style of gameplay. The only major difference is that units can become corrupted by Chaos, which will gift them different abilities. While I have touched on the general gameplay of Dawn of War II above, Retribution deserves a special mention by itself. In Retribution, which is set 10 years after Chaos Rising, the Imperial Inquisition is essentially moving to wipe out the entire sub-sector and kill all life. It doesn’t matter if they are innocent or not-they want to stop the chaos. You have about twelve main missions to do, some of which can last quite a long time, along with a bunch of optional missions. The optional missions are good, as they will enable you to level up your squads and gain extra wargear, which can be very useful for later missions. One single side mission took me about 50 minutes to finish, but it gave me some very useful equipment and the mission itself was great. Even the optional missions have a lot of polish on them. The optional ice planet mission was especially great, as it gave me a bodyguard for my main hero which was extremely helpful later on. 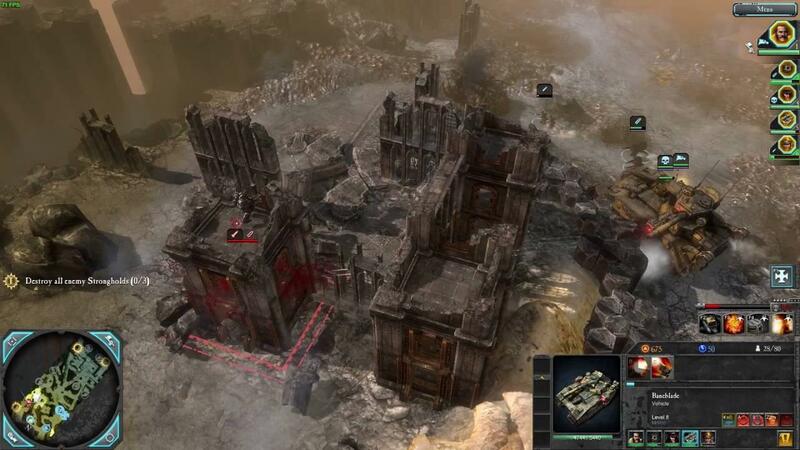 Warhammer 40,000: Dawn of War II: Retribution is probably my favourite of the three, as it brings back the unit-building aspect of strategy games that I much prefer. During missions you will be able to capture different Strongholds that will allow you to build new units. This makes the game feel more like the kind of strategy games that I know and love. You can also give units upgrades during missions, which opens up a bunch of different play-styles and strategies depending on what you’re facing. You’re also not limited to playing the campaign as one side, you get a choice between six rather different factions and the campaign plays out a little differently with each. I have found Retribution to have a far more exciting campaign overall, with much more interesting gameplay and story than the previous two games. I like Retribution so much I even thoroughly enjoyed the tutorial mission. I decided to go with the Imperial Guard as they had an almost British sound and quality to them. The commander sounds slightly posh too which is amusing. Something about aiming low on a big alien so he can mount it’s head on his wall. One particular mission was immense! Not only was the planet being bombarded by spaceships from high above, you're also against the timer as you try to escape total annihilation. The amount of explosions going on was incredible. You're constantly being battered about by orbital bombardment and shock-waves from explosions. You eventually get trapped in an area where all the races of the planet are coming together, and you end up battling it out to lure the boss out. It was like a big all-out war in an arena, and it was really damn exciting to play. I barely escaped with my men and only a single minute left! The ending scene of Retribution is different based on who you played through the campaign, which is another cool thing about it. The online gameplay in Retribution is basically the same as it is in Dawn of War II. Different sides, different maps, but essentially the same gameplay. Note: The only parts I haven’t been able to test are “The Last Stand” game modes, as you need three people online to play it. Overall, I found them to be a seriously fun set of RTS games and damn good ports. Anyone who prefers space fantasy over historical stuff will enjoy these immensely. Even though I am not usually a Warhammer fan, Warhammer 40,000: Dawn of War II and the expansions have won me over completely—especially Retribution. Now I am excited to see if Dawn of War III ever comes to Linux. Here’s to hoping I can continue the fight one day. Final note: I will probably do a livestream of it tonight, so be sure you are watching over our Twitch channel. It's likely to also be featured in our usual weekly livestream tomorrow if you can't catch the show tonight. Oh cool! Was never a Warhammer fan, but that might change now. Those are FPS numbers to celebrate! 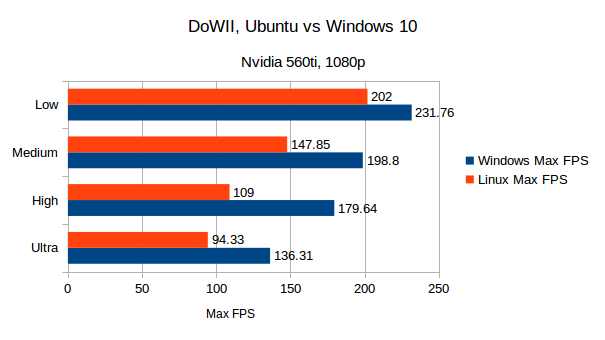 I don't mind at all having lower average FPS, if it means no drops to 14-20FPS as Windows does here. Great article Liam. Great work Feral! In case you only skimmed the article: online multiplayer is not cross-platform with Windows players. Be careful with your purchase if you intend to play with friends. Unfortunate about the cross-platform issues, but still looks really good. I'm eyeing off some space marine specific dlc (I already have the Dark Angels pack) and look forward to getting back into Retribution and Chaos Rising. Does the original DOW2 have anything worthwhile if I already have the latter two games? AnxiousInfusion In case you only skimmed the article: online multiplayer is not cross-platform with Windows players. Be careful with your purchase if you intend to play with friends. Or only play with your cool friends (i.e. 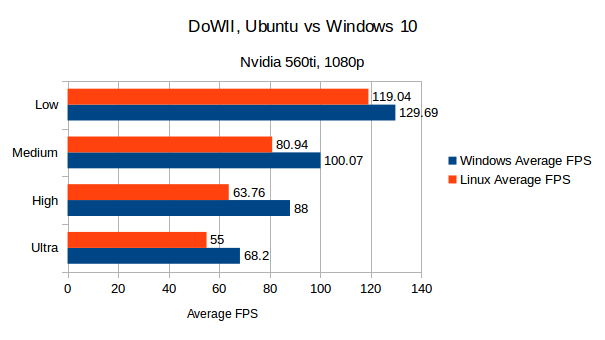 other Linux/Mac gamers). You'll find lots on our Steam Group: http://steamcommunity.com/groups/maclinux We'll be doing multiplayer events every Monday! Liam might be joining us. Be cool. Be cool like Liam. Can someone explain why cross platform seems to cause problems? Is it engine specific ? drmoth Great article Liam. Great work Feral! Yes! Thanks Feral. Thanks Liam. Support cross-platform multiplayer, seems be the next barrier to break in games for Linux and Mac. pete910 Can someone explain why cross platform seems to cause problems? Is it engine specific ? Quote Note: Sadly, like Company of Heroes 2 these games do not support cross-platform multiplayer with Windows. Important to note, as this may be a deal breaker for some of you. You can see their explanation of why this is the case for CoH2, which likely applies here too. Could be the engine - but usually engines supporting multiple platforms or being ported to another platform you'd port the network code as well. More likely is that they used a network middleware in Windows for the network code which does not exist for Linux, and which they didn't get the right and code to port. Due to legal issues, you can't just reverse engineer and implement it either without explicit permission of the company which owns the rights, leaving it on the spot we are now - a different protocol for Linux. Maybe one day a port of that network layer will find it's way to a Windows version (or a compatibility layer), but I doubt that. For the game - great. But I'm not sure I'll go for the highest option just now before I tried it. While I do love the RTS genre, I hardly found any games I really learned to love over the years (ofc, there was StarCraft, C&C and AoE).